The following is an excerpt from More of the Kangaroo: 150 Years of Australian Football in Queensland. You can purchase your copy of the book here. More of the Kangaroo will be officially launched on December 11 at Coorparoo AFC. Find out more information here. After several attempts to launch a women’s competition in Brisbane during the 1970s and 1980s, in 2000, a dedicated group of women pushed valiantly to launch a serious women’s competition. Dee McConnell from the Redland club was the most active in driving the new push. In 2001, AFL Queensland appointed Carla Hardy as a competition coordinator and in May a lightning premiership was organised at Alexandra Hills, involving the Redland, Surfers Paradise, Glasshouse-Hinterland, Burleigh and Alexandra Hills clubs. 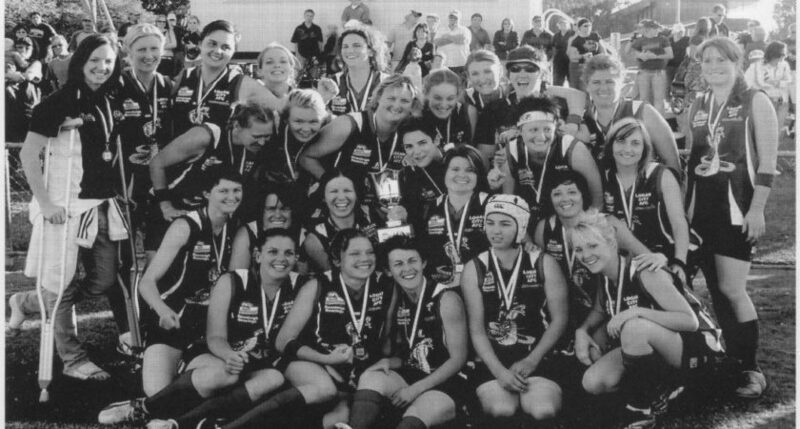 A four-team home-and-away competition ensued, with Redland eventually crowned the inaugural premiers, defeating Alexandra Hills in the 2001 Grand Final. Redland’s Shelley Gale and Billy Schloss and Alexandra Hills’ Marlo Brack and Mica Cubis stamped themselves as star performers of the inaugural season. The first season of a formal women’s competition in Queensland culminated in an exhibition match held at half-time of the AFL Queensland Grand Final held at Coorparoo. In 2002, AFL Queensland threw further support behind women’s football and Bianca Misson, a full-time employee within the football department of the peak body, was eventually appointed as the competition administrator. Misson was also a key on-field player with the Redland club. Fiona McLarty, another AFLQ employee, was active in promoting women’s football on the Gold Coast and was a star player for Surfers Paradise. McLarty’s administrative career was to blossom some years later when she was promoted to national game development roles with the AFL. Surfers Paradise improved remarkably, convincingly defeating Alexandra Hills in the 2002 Grand Final by 21 points. Monica O’Brien, Jackie Petterd, Erin Betts and Fiona Stevenson starred for the Demonettes. The 2003 season kicked off with a lightning premiership held at Redland. Women’s football had commenced in Cairns by that time, and a group known as the Cairns Crocs had made their way south and surprised their Brisbane opponents, winning the pre-season competition. Several Cairns players, including Kat Pender and Ellie Martin, were selected from the carnival to play in the first Queensland women’s team that participated in the national championships later in the year. Several new clubs entered the competition, including the Kedron Lionesses (2002) and the Morningside Wildcats (2003). Morningside, under the coaching of club legends Michael Duke and Courier-Mail journalist Gary Smart, were to soon become a strong outfit. Some of the Wildcats’ best players in the early years included Shelley Gale and Bianca Misson (both ex-Redland), Juanita Mottram and Peta Ferguson. The Wildcats won through to play the highly-fancied Surfers Paradise in the 2003 season decider. Monica O’Brien was the standout for the Surfers Paradise Demonettes. In the Grand Final, held under lights in atrociously wet conditions at Yeronga, O’Brien’s and her fellow Demonettes’ e orts were not enough and the Wildcats caused an upset to defeat Surfers Paradise by a solitary point. By 2004 there were ten affiliated clubs, with Toowoomba, Logan, Ipswich and Redcliffe also joining the burgeoning new league. The competition flourished for a few seasons, sparking the first discussions of the creation of a youth girls’ competition. In a groundbreaking appointment, AFL Queensland engaged Charmaine Lowrie as the nation’s first employee to focus on junior development programs specifically targeted at girls. Queensland commenced participation in national carnivals, proving to be competitive against all states except Victoria. John Saunders, Marlo Brack and Bianca Misson were key personnel in the development of the state’s first senior representative teams. The competitiveness of the squad was bolstered by the strength of women’s football in Cairns – a league that proved to be on a par with the standard of the competition being conducted in southeast Queensland at that time. Surfers Paradise gained revenge for their upset loss in 2003 when they defeated Morningside by 22 points in the 2004 Grand Final. Emily Pike was on fire in the big game and Emma Ferrante and Fiona Stevenson assisted her. Glasshouse- Hinterland, based 75 kilometres north of Brisbane at Landsborough, was victorious in the new Division 2 competition, defeating Redcliffe by one point in the Grand Final. In 2005 it was the Wildcats’ turn once again, defeating Kedron by eighteen points in the Grand Final. Morningside’s Debbie Lowe was best on ground, with Juanita Mottram and the Misson sisters, Kate and Bianca, also playing well for the premiers. For Kedron, Amy Rosenbrock and Kara Fabian were brilliant. Redcliffe were victorious over Toowoomba in the Grand Final of the Division 2 competition. Marlo Brack, who had joined Logan after Alexandra Hills had folded, announced herself as the first champion player of Queensland women’s Australian football when she collected her second League medal in 2005. Morningside’s Shelley Gale was not far behind Brack. The hard- leading straight-shooting Gale collected her fifth consecutive leading goalkicker trophy. Logan Cobras, under the leadership of new coach Marlo Brack, emerged as a powerhouse. e Cobras had assembled a young team, but they had also recruited some of the best players in the League. Come Grand Final time, Brack’s Cobras were to face the Anthea Harvey-coached Kedron. For the first time both Grand Final coaches were female. Kara Fabian, the League medallist for the 2006 season, had switched from Kedron to play for Logan, adding extra spice to the season decider. Brack, Fabian and Shannon McCartney were among the best for Logan. Former Glasshouse-Hinterland ruck Aasta O’Connor had also switched clubs to play for Logan and she dominated on Grand Final day. 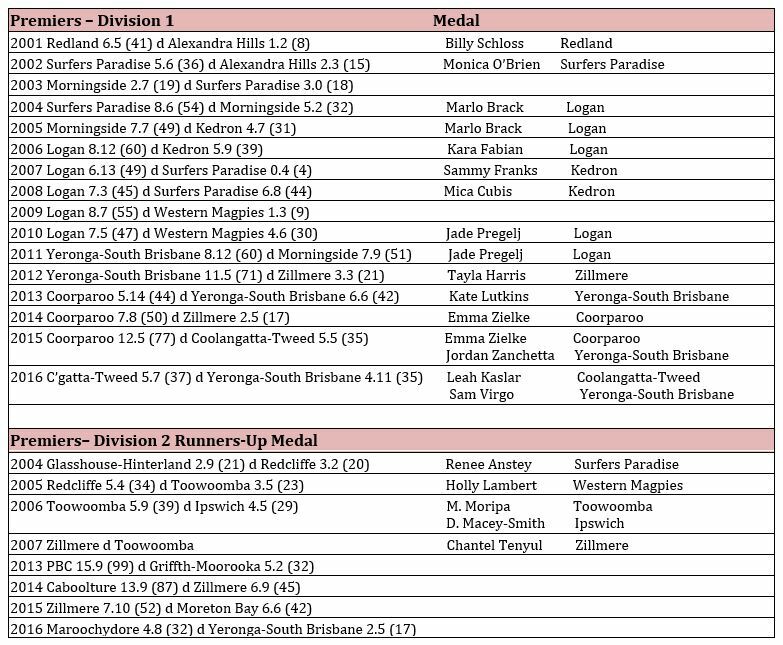 In spite of the efforts of Kedron’s Amy Rosenbrock and Seeana Creed, Logan collected their first premiership, defeating the Lionesses by 21 points. Toowoomba defeated Ipswich by ten points in the Division 2 Grand Final. The work of Charmaine Lowrie and others bore fruit in 2006 with the conduct of Brisbane’s first club-based youth girls finals in the Under 13 and Under 16 age groups. Fifteen-year-old sensation Jade Pregelj was best on ground in the Under 16 Grand Final and she backed up as a member of the victorious Cobras senior team. Logan went on to win the next five QWAFL Division 1 premierships. At over 1100 pages, More of the Kangaroo is a comprehensive history and cover the trajectory of the code throughout the state. It will include over 500 images and reveal facts about the evolution of the code at local level that are little known secretes in contemporary times.